Map of Israel with general touring routes: Tel Aviv north along Mediterranean to Caesarea, through Mount Carmel to Armageddon, Nazareth, Sea of Galilee, Golan Heights, south to Jericho, Dead Sea, Jerusalem, Dead Sea, & Red Sea. Planning a trip to Israel or Holy Land? I hope that this Map of Israel: General Touring Routes is helpful. 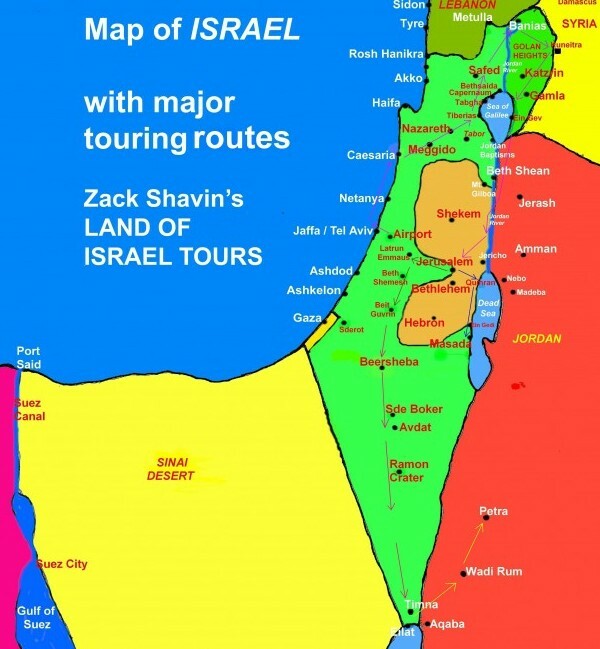 If you need further help in planning your tour please feel free to contact Zack Shavin, veteran guide & biblical archaeologist at Land of Israel Tours.